The Promised Coconut Pancakes (Kueh Dadar) | Izzy have you eaten? Spoon some coconut filling onto your pancake….. 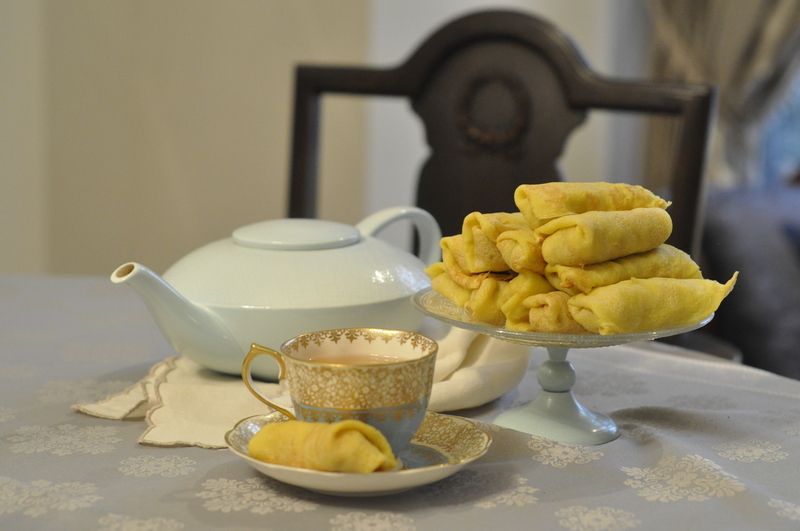 Perfect for breakfast or afternoon tea. First up: cooking the crepes! Made the coconut pancakes finally. It has been years since I’ve made them, but how I wished you were around to have one. They really are so delicious and amongst the myriad of yummy hawker stall snacks available in Malaysia at all hours of the day or night, these are amongst your favourite. Nana and Aunty R make it a point to stop and get some specially for you when we visit. It all started with the Malaysian themed supper club dinner last week-end. 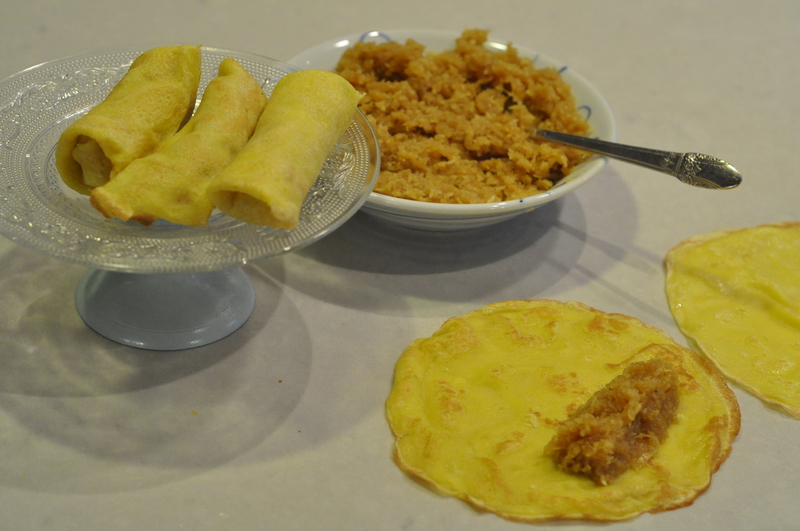 As the Brands were in charge of desert , I pulled out all the popular Malay ‘kueh’ recipes I had. Somehow I could not see myself making piles and piles of these guys for our large group on a busy week-end, so I settled for the custard Kinabalu which is a Nana favourite. The pancake recipe stuck with me though, because of so many good memories attached to this particular dish, and I was determined to make some soon. So here it is, and gluten free too! Amazingly, these delicious babies are made entirely of rice flour and coconut milk so no diary either. NOT vegan however, so your house mates might have a problem with them………. the crepes before filling are light and delicious, and Claudia ate a couple with Nutella. Worth keeping in mind that if you want to cook plain pancakes for a gluten intolerant friend. One nice memory which came back to me while making these: when Durga and I ran the Pepper Tree catering company about seventeen years ago now, our fusion Malaysian Indian lunches were in good demand in the somewhat dull public service world. We went from regular board room lunches in various government and private law practice offices to being the ‘official’ caterers for the Secretary of Foreign Affairs in just a few months. With our special security passes, Durga and I would park in designated spaces much to the chagrin of long serving staff, and walk into that labyrinth which was the old Department of Foreign Affairs and Trade building opposite the National Gallery. We’d wheel in our semi-prepped meals ( no proper kitchen facilities in the private dining room of the Secretary !) and serve up delicious courses of dishes to various visiting heads of states. It is a wonder they trusted us to feed such important visitors, two fun loving ladies who who were having a ball cooking for the local community’s big wigs. We had a printed menu from which our customers could chose. The much thought out menu comprised of favourites which Durga and I loved to cook, and which we felt would make an eclectic but plausible combination of Malaysian and Indian lunches, with a healthy and light touch. When kueh dadar was ordered for desert, I usually called up Anoi, my dear friend Raha’s sister, to help make them. Durga and I would be busy cooking up a storm in the rented commercial kitchen at the Gorman House Arts complex. I remember always being blown away by Anoi’s pancakes: they were perfectly, incredibly, neat and even, as if they’d come out of a machine. But one only needed to take a bite to be sure they were most certainly home made. Mine are always rustic, as the accompanying photos show. I just can’t wrap and fold them as neatly, but Izzy, you’ll know when you make them that its the taste that counts! Also, traditionally, these Malay pancakes are GREEN, from the flavouring of pandan leaves, but since the leaves are sometimes hard to find, I have left that ingredient out, and my pancakes are……… not green! BTW, aren’t the pictures great ? Thanks so much, little C, for the pictures you have been taking for me, turning my plates of food into memorable images. I love this three way collaboration/communication with my girls!!! Put the ingredients together in a small saucepan and cook over an low flame until sugar has dissolved and coconut softens in the mix. Stir constantly to prevent from sticking and burning. When the water has evaporated, turn off the heat and leave to cool completely. Mixture can be made three to four days in advance and kept in a sealed container in the fridge. Mix all the ingredients together except for the oil. Beat well. Fry the pancakes as you normally would: pour two tablespoons of the mixture into a hot, nonstick fry pan greased with a little wipe of oil. 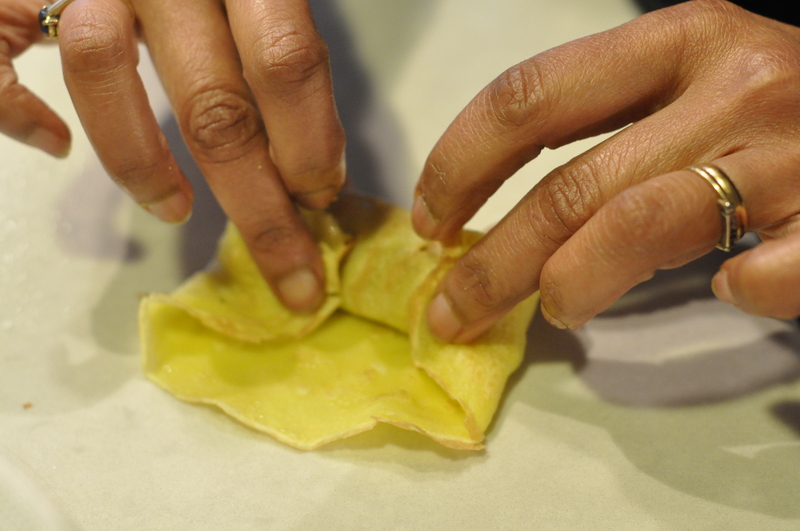 Swirl the pan around for a thin and even spread of mixture. 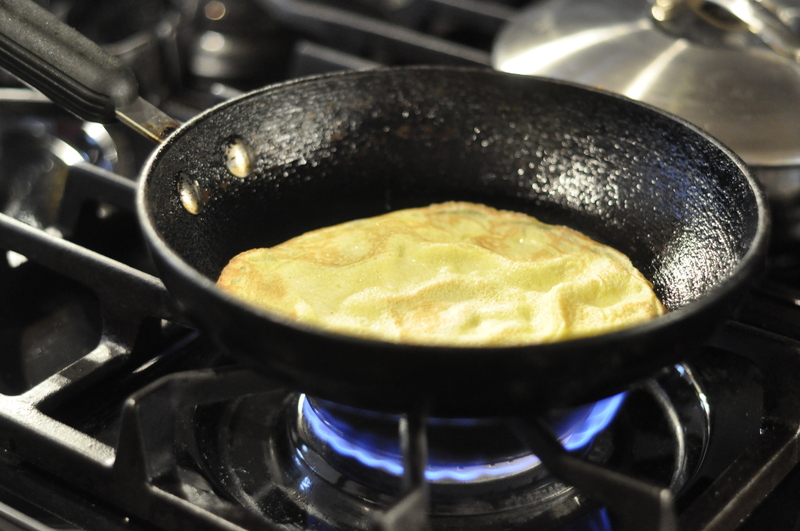 Pick up the edge with your fingers or an egg flip, and turn the pancake over after a few seconds. Spoon coconut mixture into the pancake, wrap it up neatly, and enjoy! These pancakes are best eaten fresh. Any left overs should be tightly wrapped and refrigerated. Steam lightly or microwave to refresh before eating the following day. This entry was posted in GROUP C, Uncategorized by tgb9593. Bookmark the permalink. Love checking on this to see what you will post next. Some are even making it into the kitchen to be tried! How do you have the time with all the changes about to engulf you? hi, Lyn! I have been thinking of you and wondering if you’ll come to Sydney later this year and help me unpack…… an excuse really to see you. How are things? Is Russ in town? What on earth could you possibly get outof this blog to cook, Miss Chef extrodinaire? Oh, Rita! What an honour that you would look at this and even suggest making something. I know you are a fine cook so this is just easy simple stuff ( for you) aimed at Isabel’s generation of new cooks.